Our Lady of Bethlehem with a Male Donor. Cuzco, 18th century. Image found here. This past weekend, my wife and I were in Chicago, ostensibly to attend a friend’s wedding. We turned that into an excuse, however, to arrive a few days ahead of time and do some sightseeing: my wife had never been to Chicago before and I’d last been there over 20 years ago, so much of the time I felt much the same as she did about what we saw. It was a good visit, filled with good sightseeing and, thanks to my wife’s foodie soul, good food as well. Before we left Wichita, I made sure to check the Art Institute’s list of current exhibitions, and I was pleased to learn that one of them was A Voyage to South America: Andean Art in the Spanish Empire. It’s a small exhibit (only 16 items); but, seeing as I don’t believe I’d seen any colonial art from the Andes in person before, I was glad to have the chance to see what I did. 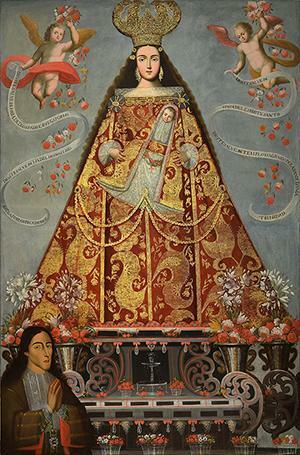 This exhibit is the first of its kind for the museum and will remain up until January of 2016, so anyone who will be in the area between now and then who has an interest in Spanish colonial art should give this a look. Antonio de Ulloa, Jorge Juan. 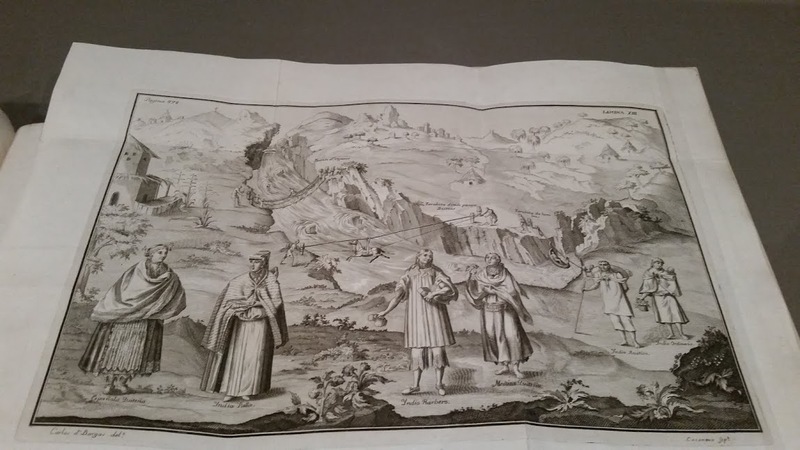 “Casta Figures in a Landscape,” from The Historical Relation of a Voyage to South America, 1748. Photograph by Megan Buaas. The other, serendipitous fact of my seeing this exhibit when I did is that I have been reading a recent history of Spain’s exploration of and colonizing efforts in the Pacific, so the art work here provided a nice visual complement to that reading. Of course, no exhibition purporting to cover 300 years of colonial art via 16 objects is going to go too much into depth. Its chief virtue for me, therefore, was in showing me that, despite my reading of that history, I have still more reading to do. 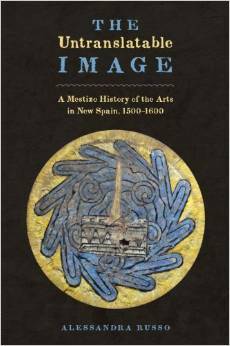 The Untranslatable Image: A Mestizo History of the Arts in New Spain, 1500-1600. Amazon link here. I still haven’t finished reading Russo’s book, but it’s a measure of the value it has for me that a quick perusal of the last chapter persuaded me to ::sotto voce:: copy it. It was either that or incur the wrath of the good people at the U. of Kansas’ Watson Library’s interlibrary loan department for being late in getting their book back to them. Anyone who likes Serge Gruzinski’s book The Mestizo Mind (an important book for Russo’s work) and/or is looking for a very different way of looking at and thinking about the artistic production of New Spain in its first century will want to look at this book. Given that Russo’s book’s coverage ends where it does, she does not mention casta paintings. However, as I have thought about her close, attentive discussions of maps serving as not only accurate renderings of physical space but also as their indigenous or mestizo makers’ attempts to make new, conceptual sense of their home, which, now that the Spaniards have arrived, has caused their land to be turned upside-down (a phrase she quotes at least two indigenous and mestizo chroniclers as using), it occurs to me that we could also discuss casta paintings in those same terms. They, too, were made mostly by mixed-race people; they, too, were the visual records of a Crown-sanctioned attempt to impose order on a bewildering variety of racial combinations; and/but they, too, they seem to be about more than the business of reinforcing the Crown’s legal, political, and social hierarchies. (This seems especially true of the paintings done toward the end of the colonial period.) In other words, the casta paintings can be said to serve as kinds of maps, as well, complete with “directions” (in the form of the names of some of the different castas), that also reflect at some level their makers’ own sensibilities as they paint people whose racial types they know–indeed, as they occasionally paint their own racial types–types, moreover, that didn’t exist before the arrival of Europeans and, later, people of African descent. Below the fold, I have examples of three casta paintings that I hope will help illustrate what I am getting at.